The world’s first child created using a controversial new "three-parent" baby technique has been born in Mexico. Scientists say the technique combines DNA from three people - the mother, father and an egg donor. Limited details about the birth were revealed ahead of the American Society of Reproductive Medicine's scientific congress in Salt Lake City next month, where it will be discussed more fully. According to critics, the procedure is tantamount to genetic modification of humans or even “playing God”. But supporters say it allows women with a particular type of genetic disease to have healthy children who are related to them. The magazine New Scientist, said the baby was now five months told and born to Jordanians parents. 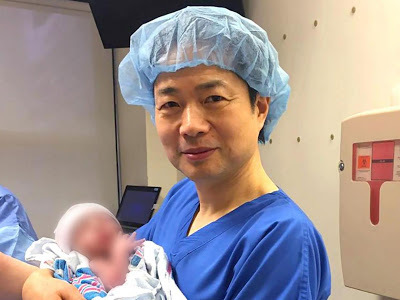 The work was carried out by a team of experts from the US led by Dr. John Zhangof of the New Hope Fertility Center in New York. The goal was to prevent the baby from inheriting a fatal genetic disease from his mother, who had previously lost two children to the illness. The child’s mother has Leigh syndrome, a fatal disorder that affects the developing nervous system and would have been passed on in her mitochondrial DNA. Although she is healthy, two of her children have died as a result of inheriting the disease: a girl who lived until she was six and an eight-month-old baby. The research summary identified the mother as 36-year-old and said her pregnancy was uneventful. One of the five eggs the researchers treated was suitable for use. The technique used by Dr John Zhang and his team involved removing some of the mother’s DNA from an egg, and leaving the disease-causing DNA behind. The healthy DNA was slipped into a donor’s egg, which was then fertilized. As a result, the baby inherited DNA from both parents and the egg donor. The technique is sometimes said to produce “three-parent babies,” but the DNA contribution from the egg donor is very small. People carry DNA in two places, the nucleus of the cell and in features called mitochondria, which lie outside the nucleus. The technique is designed to transfer only DNA of the nucleus to the donor egg, separating it from the mother’s disease-causing mitochondrial DNA. Critics question the technique’s safety, saying children would have to be tracked for decades to make sure they remain healthy. And they say it passes a fundamental scientific boundary by altering the DNA inherited by future generations. Mitochondrial DNA is passed from women to their offspring. Still, last year, Britain became the first country in the world to allow creation of human embryos with the technique. In the U.S., a panel of government advisers said earlier this year that it’s ethical to test the approach in people if initial experiments follow certain strict safety steps. That report was requested by the Food and Drug Administration, which is currently prevented by Congress from considering applications to approve testing the technique in people. "We believe it’s time to move forward with FDA-approved clinical trials in the United States." Henry Greely, who directs the Center for Law and the Biosciences at Stanford University, said Tuesday he sees nothing wrong with using the technique if it is safe and is aimed at diseases clearly caused by faulty mitochondrial DNA. But he called the research leading to the newly reported birth "unethical, unwise, immoral." He said the approach “hasn’t been sufficiently proven safe enough to try to use to make a baby." Dieter Egli of the New York Stem Cell Foundation, who has done work in the area, was cautious about the implications of the new report. "I wouldn’t go out there at this point and tout the accomplishment because we don’t have enough information,” he said Tuesday. “We do not know exactly what was done. We have to wait for a fuller report," he said.